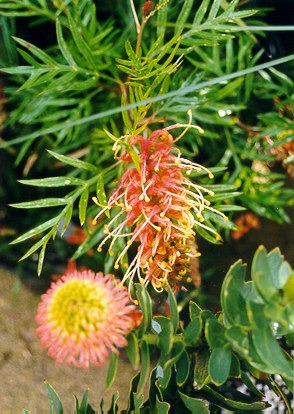 Attractive shrub with green fern-like leaves and large profuse coral-pink & yellow flowers (similar to Grevillea 'Robyn Gordon'). Excellent landscape shrub suitable as a low screen or hedge. Attracts Hummingbirds.